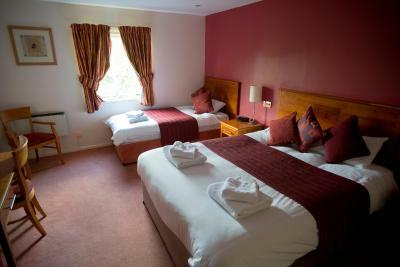 Lock in a great price for The Conningbrook Hotel – rated 8.3 by recent guests! I would just like to highlight the remarkable kindness of Georgina who works here. I had a week sitting by my brother’s bedside until he died - Georgina was unbelievably sympathy d understanding. That deserves 5 stars. Thank you, Georgina. You are a gem. This hotel is good value and has a large and friendly bar/restaurant. Typical older English hotel at a realistic price. Room was comfy & warm on a cold day, the dinner was nice, and the breakfast selection was brilliant. All staff was friendly I could not ask for more just what we needed after a long day. Breakfast menu, quality and quantity was excellent. The staff were efficient and friendly. The shower was very good, good pressure and plenty hot water. Nice quality towels. Really friendly relaxed atmosphere,great park for dogs across the road. 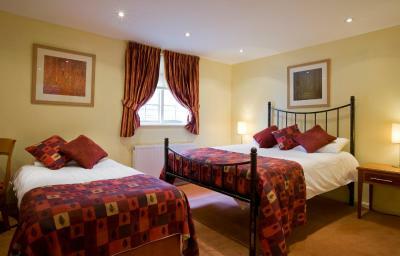 Very comfortable accomadation, clean and excellent place to explore Ahford, Canterbury and nearby towns. 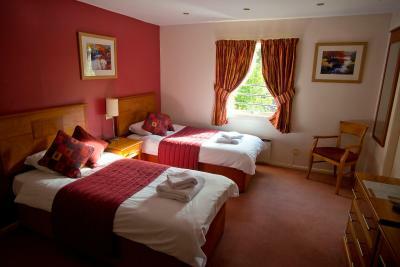 Very friendly staff, large room, large bathroom very clean and tidy, good location and plenty of parking. Nice bar and restaurant. What more do you need? The Conningbrook Hotel This rating is a reflection of how the property compares to the industry standard when it comes to price, facilities and services available. It's based on a self-evaluation by the property. Use this rating to help choose your stay! One of our best sellers in Ashford! 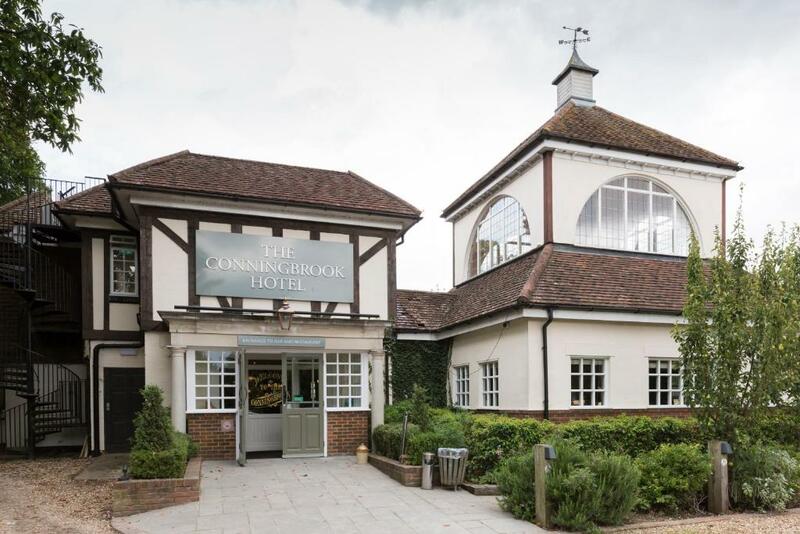 The Conningbrook Hotel is located in the village of Kennington, a 5-minute drive from Ashford and the Eurostar Terminal. It offers rooms with satellite TVs, a restaurant and free parking. Rooms at the Hotel Conningbrook have large bathrooms with baths, showers and hairdryers. 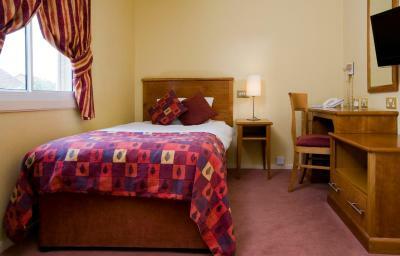 Rooms also include radios and tea/coffee making facilities. The Conningbrook Restaurant & Bar serves traditional home-cooked food. Vegetarians can be catered for and roast dinners are served on Sundays. 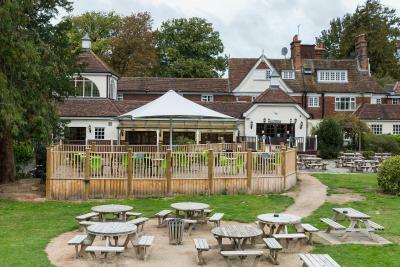 The bar has a selection of award-winning ales and a bar menu. 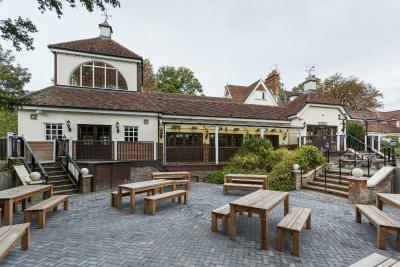 There is also a large beer garden with plenty of seating. 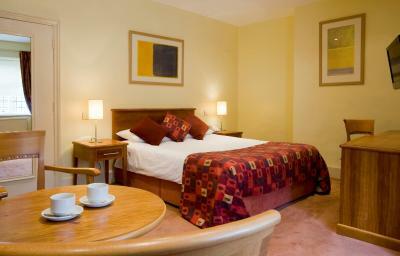 Junction 9 of the M20 motorway is less than a 5-minute drive from the hotel. Ashford Golf Club is 2 miles from the Conningbrook Hotel. 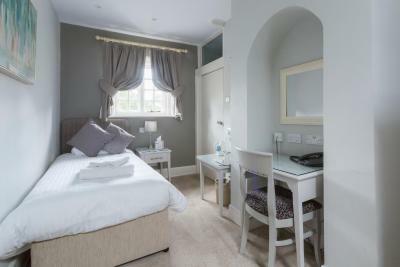 When would you like to stay at The Conningbrook Hotel? A flat-screen TV and an private bathroom are included in this room. 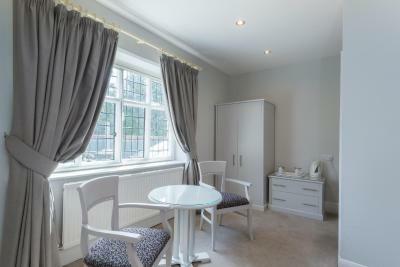 This room can be converted into a double room on request. Spacious room with a four-poster bed. This family room features a satellite TV. 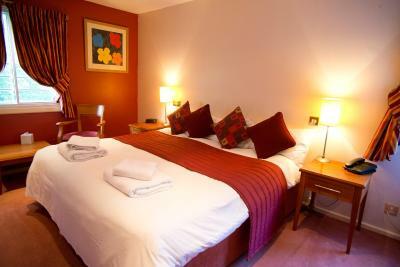 The family rooms are suitable for a maximum of three guests. If you require an extra fold out bed, please inform the property prior to arrival. House Rules The Conningbrook Hotel takes special requests – add in the next step! The Conningbrook Hotel accepts these cards and reserves the right to temporarily hold an amount prior to arrival. If expecting to arrive after 11 pm, please contact the hotel in advance. Nothing. It is what it says on the label and more. We stayed in a family room, which was very clean and comfortable -granny loved the shortbread! 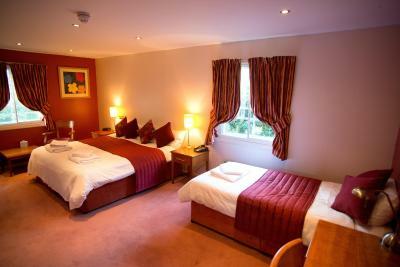 Plenty of amenities in the room, tea, coffee, hairdryer, complimentary soap, shower gel etc. We were made to feel very welcome travelling with our dog, and told that they would reserve a table for us in the bar area so that we didn’t have to leave the dog in the room, and that we could bring her down with us for breakfast. Had a lovely dinner in the bar and great quality breakfast in the morning (dog enjoyed the sausage) - truly dog friendly hotel. We were only staying here because it was near to the Shuttle terminal but fully intend on returning and using it as a base to explore Kent and the coast in future. Nothing, one would have to be a right miserable git to find fault! Great staff- truly wonderful people, friendly helpful & just plain nice. Unfriendly staff, took an age to get breakfast, Staff not prepared for breakfast at 8am! Very poor choice on the "buffet"
Good beds. Lovely dining area. Plenty of parking. Easy access from M20. Shower blew a little hot and cold. I thought this was fantastic value for money. Spacious very comfortable room. Staff were able to accommodate my dietary needs. Nothing not to like. Very uncomfortable bed and very bad floor boards threw out the building. Restaurant and bar was very good,friendly staff and very nice food. Cold selection side of the breakfast was basic. 2 out of the 3 mornings there was no greek yoghurt available. Although a very large car park it gets busy and hard to find a space. Our room was over one of the entrances to the hotel side and the area for smokers!!!!! thus noisy at times and cigarette smoke noticeable. Evening meal menu was good and varied. Breakfast hot food menu good. The room was large and comfortable with plenty of storage space. Bathroom was also a good size with choice of bath or shower. Served good draught beer. Plenty of space outdoors when the weather is good. Reception is separate from the bar side of the business so no need to wait to be seen. The room was lovely and breakfast was great. No sound proof, you can hear people talking next door, and the floor boards were creaky and old. Every time someone goes to the loo, you hear so did not get much sleep. Windows were old and tired. Bed mattresses need updating please. Breakfast was tasty. Loved that there was a bath. A spacious room. Staff were friendly and fairly attentive.